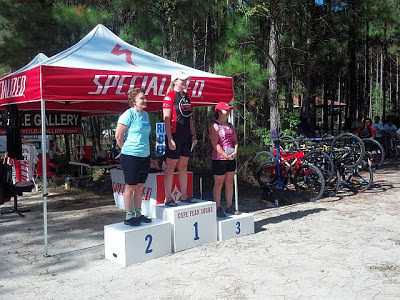 Despite being rather unprepared to re-enter the endurance mountain bike racing scene after such a long hiatus, Steve and I just couldn't resist the chance to head down east for the Brunswick Brawl this morning to try out a new-to-us trail. I did at least realize the shorter option was probably in my best (lack of fitness) interest, so signed up for the 3-hour category instead of the 6-hour. 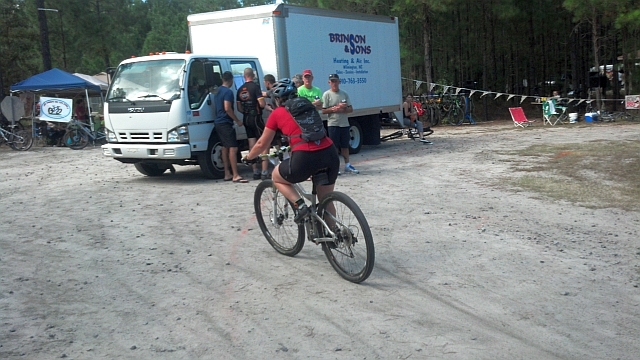 On arrival at the venue, the sun was out with temperatures in the 70s - just absolutely perfect mountain biking weather. The trail itself was really nice with pretty views, some fast flowy sections and plenty of tight stuff through the trees, although I did have to be careful in the turns as the soil down there near the coast is obviously very sandy with some sketchy corners. There isn't much in the way of elevation, again due to the coastal location, but the trail builders have done a great job of making the loops a lot of fun and you can always up the challenge by riding faster. ;-) And for this event, the race promoters provided super nice swag bags, even including a seriously cool wicking jersey to all participants! The race loop was roughly 9 miles long, and somehow despite struggling through intense muscle fatigue and general less than optimal fitness, I managed to complete three laps in 3:25:19, good enough for a second place finish, about 19 minutes behind first in the women's three-hour category. Oh, and did I mention they paid out CASH for at least the top three in each division?!?!?! 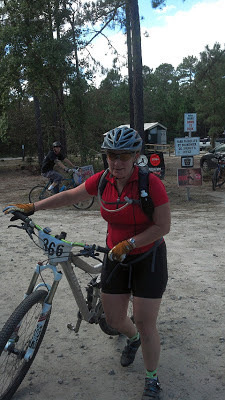 We had a great time and will definitely keep this trail and race on our list of fun things to do.